Going from spicy to even spicier, we entered the northern part of India. It was interesting to see the differences between North and South; From food to different structures of the buildings to new styles of clothes. We had been told before that it would be more difficult and dangerous to hitchhike in the North, but we found that wasn’t true at all! From Hampi our journey took us to the city of Mumbai. The way there was quite exciting and intimidating at the same time. After all of us were able to get a ride in a truck, we spent the next eight hours on top of the roof, feeling the breeze and watching the stars at night. It felt really good to finally cross off one major item on our hitchhiking bucket list. Unfortunately, this blissful ride came to an end when the drivers suddenly wanted money and didn’t want to let us go without paying. Long story short, the police got involved, the whole town got on the street to discuss our dilemma and we eventually got accomodated in a nearby temple. Once we arrived in Mumbai, we stayed for a while switching between a lot of different hosts. Mumbai is a very beautiful and modern city with so many things to do. Some parts of it look more like a European city due to the colonial buildings and their architecture. In the beginning of our stay, Yannic left us for Canada to get his Working Holiday Visa and after some more days Nadya came back from Hongkong. A few days later we met some people over Couchsurfing and got the chance to do an English voice over for a Bollywood movie called “Half Girlfriend”. Our day at the studio took us so much longer than expected but was a very unique experience. Even though we played with Holi colours before in Hampi, the real festival was about to start and we decided to celebrate it in Bujh in Gujarat. Close to the town lies a beautiful salt desert where we spent the day. It was an amazing sight, white as far as the eye can see. We were tempted to try and walk to the other side but instead made a colourful mess out of ourselves and the salty ground. After dark we managed to hitchhike a tour bus where we danced and made new friends. To get to our next destination, Delhi, we had to take a train because of time issues. When we arrived in the capital, we met our friend Negar from Iran, who had invited us to her wedding. We had a lot of fun seeing her and other Iranian friends again and spending time together! The wedding itself was a beautiful and colourful event and we loved dressing up in Sarees and traditional clothes. 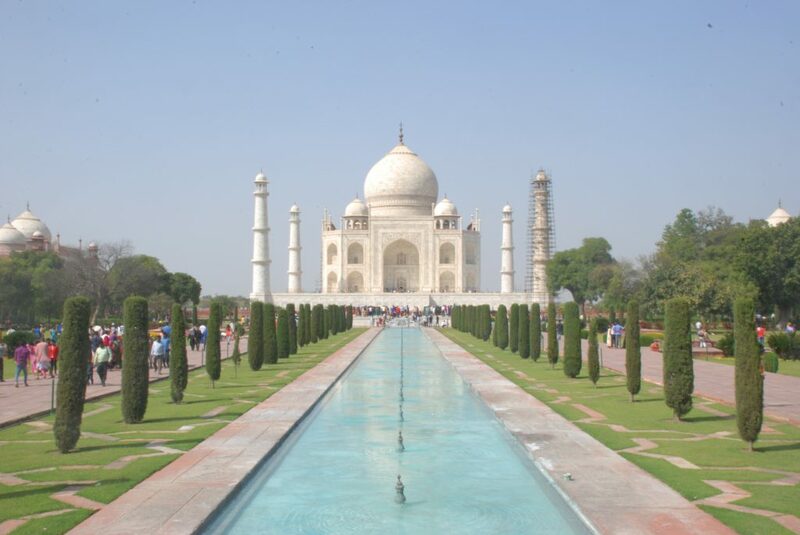 By doing some sightseeing, we tried to explore this huge city and later some of us went to see the Taj Mahal in Agra. In Delhi, we initially planned to apply for the Myanmar visa, but decided that it was too hard and expensive to enter from India. Instead, we decided to fly to Thailand and enter from there. Later on, Yannic joined us again and the group split into two, to see different parts of the country. Yannic and Ia travelled to Rishikesh to relax and swim in a crystal clear part of the Ganges. The rest of us went to Jaipur where we were able to meet up with an NGO training local women to become taxi drivers. After a day trip to Bikaner to see the famous rat temple both groups met up again in Amritsar. Amritsar is the home of the Golden Temple, the holiest Sikh temple in the world. We stayed close by in a backpacker accomodation and visited the temple many times. We thought it was especially beautiful at night when the golden light reflects on the water. Since we were close to the Pakistani border, we also watched the Wagah border ceremonial flag exchange. It was interesting to see, but for us it felt more like a touristy attraction than a traditional ceremony. Finally seeing the “real North”, our journey took us to Dharamshala, a town up in the Himalayas and the Dalai Lama’s residence in exile. Since the beginning of the Tibetan exodus, many Tibetan refugees have settled in the Himalayan ranges in the North of India. One can clearly see the impact on the culture: Here most of the shops sell Tibetan handicrafts and the food changes as well. We met some of the refugees and visited the Dalai Lama’s temple in McLeod Ganj. Unfortunately, some of us got sick and couldn’t participate in everything but everyone felt good breathing some fresh mountain air after all the polluted cities. While volunteering in an English class we met two girls from Thailand and after having some incredible Thai food we did a small meet up at our hosts place together with the girls and some other travellers. The second town we visited in Himachal Pradesh was Manali, the “Swizerland of India”. Almost freezing to death as we arrived in the early morning, we were later welcomed by a friend of Yannic who we stayed with. In the old part of town we got to know a very talented tailor and asked him to make our first Spicyroad shirts. The group split up again as Murad and Nadya had to go to Delhi earlier than the others. Nina and Elena decided to go hiking in Manikaran and Yannic and Ia stayed in Manali for two more days. Once reunited in Delhi, Ia left to fly to Nepal in order to have more time there before she would leave to Korea. On our last days in the city, we visited a Rohingya refugee camp to interview people living there and organized a playful afternoon for the children. Moreover, we got to see another NGO supporting Afghani refugee women. After having seen the city before, everyone wanted to leave Delhi as soon as possible, so we travelled to our last stop in India, Varanasi. Here we encountered the religious traditions involving the Ganges river. While on a boat tour we saw a dead body floating in the water and later that day went to the cremation area next to the river. A lot of us were overwhelmed by the controvercy of this city. On one hand it is a very colourful and touristy place, on the other hand you are surrounded by death and intimidating practices which are banned in the rest of the country. Looking back, we have seen so many new things, good and bad, that it is impossible to write about everything! Travelling and especially hitchhiking here has been a wonderful experience even though we often had to use public transport. In terms of work, we had a lot of very interesting and informative encounters, but sometimes it was very frustrating because we saw how the women and refugees are often treated. There are still many issues to be dealt with but we felt that the NGOs we met are doing incredible work and we hope to support them by posting about it. Meeting all these people has not only given us much more information for ourselves and the project but has changed our point of view in terms of women rights and the reality of these situations in different places. I’m aware that we have barely seen anything because we would need much more time to really understand what’s going on in this huge country. But travelling through India has given us new ideas and has shown us again why we are part of this project. Being thankful for this amazing time in India, we are looking forward to the next country, Nepal! Looking back: South India Looking back: Turkey Looking back: Iran Spicyroad’s Week in Review #16!